Get your ONE+ kit started with the versatile RYOBI 18V ONE+ drill driver kit. The powerful motor has the grunt to tackle all construction or drilling around the home. With 2 gearbox speeds and 24 clutch settings, you’re guaranteed the right amount of power for any and all jobs. The 13mm keyless chuck allows for a wide range of bits and applications. Carrying bits for multiple screws and tasks is just as simple thanks to the on-board magnet. For everything from constructing furniture to tough drilling, this handy kit is all you need. 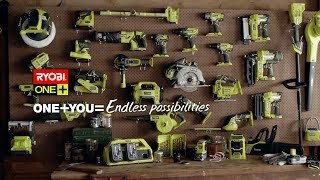 The RYOBI ONE+ range makes DIY easier than ever. Included with the 18V ONE+ drill driver is a 2.0Ah Lithium+ battery, and a battery charger. Compatible with over 60 other tools, the RYOBI ONE+ drill driver kit is the perfect introduction to the expanding range of ONE+ power and garden tools. Grab your RYOBI 18V ONE+ drill driver kit from your local Bunnings Warehouse today.